I'm a Marshall University undergrad going into game development who specializes in programming and level design. I love to explore and learn new things, every chance I get. That said, much of my time is spent buckled down on goal-oriented projects. When I'm not developing games you might find me putting together computers, or you won't find me because I'm out jogging. With each game I design I want to leave the player with something positive or useful to bring back to their real life. Whether it's a message, a lesson, or simply a good time, games should be a tool for improving people's lives. The premise is simple: collect wood, bring it back to your fire before the fire burns out and before the sun sets. Much of the work on this project was put into the tight control scheme, making sure that moving, jumping, grabbing, and dropping wood all felt responsive and satisfying. —3D modeling characters and scenery is not my specialty, so I searched for a simpler solution. After some digging, I found that MagicaVoxel would allow me to make the 3D equivalent of pixel art, much simpler than modeling. —Hours of voxel modeling later, I realized it would still be time-consuming to model a lot of scenery. There's minimal scenery in the arctic, so how about using that as the setting? —The game was initially planned as a competitive-coop experience, but my lack of Unreal experience prevented me from implementing a second character. With just one character, I decided to add a sunset and re-design the levels to make them challenging and interesting for a single player. —I had very little experience with music, but YouTuber LarryInc64 permits game developers to use his song, and his Genesis-style cover of "Cold War" was a perfect fit that complimented the frantic gameplay without getting old. In the end, this has been one of my biggest successes. 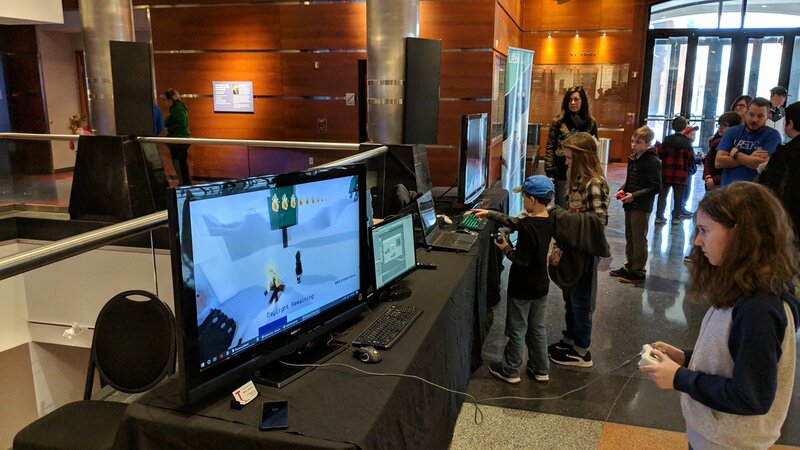 Recently (2019) I had an opportunity to bring it to the Clay Center, a children's museum in West Virginia, and talk to children about game development. I was blown away by how many of the kids really loved the simple game, even though most of them could not beat most of the levels. Lord of the Rings mod for the original Age of Empires (Ensemble Studios, 1997). This mod contains almost as much new content as an expansion pack, including four new civilizations (Gondor, Rohan, Isengard, Mordor), over a dozen new units, language file modifications, a new random-map type, and a full-length campaign. —Great care was taken to balance the new civilizations with the old, and to distribute new units and technologies in a fair manner to the existing civilizations. —The mod could not have come together if not for the help and support of the AOE community. —Several artists on DeviantArt graciously permitted me to use their work in this mod. —The campaign is carefully designed to introduce new players to new game mechanics in a safe setting, then increases the difficulty as they master the new civilizations. The project started with an idea for a Lord of the Rings campaign in Age of Empires, but the scope began balooning thanks to all the information on Age of Empires Heaven. The mod finally came to completion after about five years of development. This is the largest and longest project I have ever worked on, and my first big experience in game development. Double Fine Productions has done a lot of goofy things, including post a story on their "Action Jobs" web page about what happens when you get hired (read it here).. Being very interested in both interactive storytelling and Double Fine, I ran with it. —Two of my friends helped with the artwork. —To expedite development, as much code as possible was re-used from previous Unity 2D projects. —Tim Schafer's goofy short story was expanded into a short goofy game, complete with action-packed rush-hour driving and a final boss interview. Making a procedurally generated atmospheric horror game for a game jam sounds ambitious. It turns out that with the right team, it's the perfect plan. For this 2-day "Spoopy Scary Game Jam" hosted at Marshall University, I worked with Cory Brown (AFO Studios). He worked primarily on visuals, including characters and UI. My role was to program the game. I devised a level spawning system that generates infinite creepy floors, connected by a staircase. The game takes place on the first fifty of these floors, and then ends. Both of us had creative input and worked on sounds. An augmented reality map of Marshall University. Its main goal is to give new students and visitors a better understanding of the campus layout by showing it to them in a 3D and interactive format. Making use of Google's ARCore technology, I gave the user the ability to place a map of Marshall University, complete with 3-D buildings, into the real world. The map shows your location if you are on campus, and its size can be scaled up or down. Users can tap on any building to see its name and some basic information about it. The app was developed under a grant from the Marshall University Research Corporation. —This project was built on a virtual Marshall University made in Unreal the previous year by Cameron Asbury and myself. "No more than eight squares on the screen." That won't stop me from making a full voice-acted adventure game! The 8-Pixel Game Jam doesn't allow you to have any more than eight single-colored pixels on screen at a time. I knew a lot of submissions would be minimalistic, so I took it as a challenge to design a game that felt full and alive with no more than eight pixels. —There were no restrictions on sound. Music, sound effects, and a small group of voice-actors bring this visually plain story to life. —In-game characters, items, and props are all represented by single blocks, made easily identifiable by color. —An inventory gives the player freedom to interact with the world as they please. John Harper, credited as "Puppet," did most of the programming and provided valuable input on game direction. Template by Marketify, modded by sonictimm.